Join us for the exact day of the New Moon as we reap the benefit and support our beautiful Mother Moon, Mama Killa. New and full moons create a very potent time to state your intentions and for your personal growth work, open to change with support from the spirit world and cosmos. Pachakuti Mesa Tradition (PMT) 5-Part Apprenticeship begins January 25, 2019 at Spirit House Retreat Space in Woodacre, California. Just a $100 deposit holds your space, and monthly payment modalities are available (see below). In Quechua, (one of the languages of the Andean Regions in South America) the word pacha translates to earth, world and even soil and the word kuti translates to turning, churning and reversal and sopachakuti means world reversal or turning. Thirty years ago, don Oscar Miro-quesada brought together the two rivers of his 17- year apprenticeships with his two teachers. (don Selso Roja Palamino of the North Coast of Peru & don Vargas Coriharmaun Benito of the Andean mountains of the Cusco region). In Oscar’s visioning these two rivers of knowledge came together as one, and he consecrated the Pachakuti Mesa Tradition (PMT). In Oscar’s vista (deep visioning) he could see, as prophesied by many – the vast planetary changes coming our way. We are at a time of great turning and churning, have you noticed? How is this change infiltrating into your life? What tools are you using to assist in staying steady during these times? Do you find you are knocked off balance by the uncertainty that we are facing? Many folks may feel numbed out by all the social media & technology or experience this intensity as a blanket of heaviness that feels like a dense weight. If it feels intense, it’s because it is. As a Sanctioned Teacher for the Pachakuti Mesa Tradition, instructor Jnana Gowan believes it is her duty to be of service and assist others in finding ways to navigate these wild waters of change. There is still time to join this retreat. We Began in January 25 of 2019 and immersed into the PMT 5-Part Apprenticeship Series. Offered in a full, rich retreat setting, in sacred circle with others, you may explore the living lineage of the teachings that don Oscar was asked to pass along to other earth walking seekers. These teachings are transmitted to those that desire a deeper connection to self and to the planet, to those that have a desire to be of service to others and to be a spokesperson for our beautiful planet earth, our pachamama. That is why the retreat setting is so important, appropriately named, Spirit House. The space, located in Woodacre, California, provides a supportive and pristine container for this powerful growth work. And though you will feel a million miles from it all, Spirit House is only 25 minutes from San Rafael and 1.25 hours from both San Francisco & Berkeley. · Dinner consisting of vegetarian soup and light fare Friday & Saturday . This retreat has an organized potluck - participants asked to bring items to complete the meals. More info upon request. Includes a simple, partial meal program, and light snacks. Participants are designated a food item to bring to complete meals plans . To hold your space, a $100 non-refundable deposit is required. The remaining balance is due 30 days prior to the weekend intensive (Dec. 26). For PMT II through PMT V, an ongoing monthly payment program will be in place for each participant, based on their sliding scale rate. Please contact Jnana at powerhed@gmail.com or (510)734-4122 with questions, to register and make your deposit, or to get on the mailing list. Instructor, Jnana Gowan: As the director of the Ukhu Pacha Healing and Inquiry Space in Albany, California. Jnana has a private practice and leads transformational programs which combine her depth of knowledge of yoga, ritual, ceremony and healing. A PMT mesa carrier since 2008 and a teacher (of many sorts) since 2000, she's completed the 5-Part Series. (twice) She has been teaching the PMT 5-Part Series since 2016. Jnana has attended numerous ceremonial events with originator of the Pachakuti Mesa Tradition, don Oscar Miro-Quesada. In addition, she has gleaned deep teachings from her apprenticeship-work with author and healer, Mateo Magee. Using the powers of the full moon and the auspicious evening of Passover, please join as we continue our studies of the internal, of the lower realms also known as the Uhku Pacha. Together we will shine the light of the conscious mind into the unconscious. We will offer the ritual practice of Limpias on one another & by live drum journey, make our way to the Ukhu Pacha, awakening more deeply to who we are. The journey is guided (initially) by voice and will include live drumming. Start the New Year with shamanic journey work. By-pass the pesky mind and get right to the heart of the soul. Join us for the first new moon of winter. We reap the benefit and support our beautiful Mother Moon, Mama Killa. New and full moons create a very potent time to state your intentions and for your personal growth work. Let us take this time to state how we WANT to be in this New Year and travel to the heavenly realms known as the Hanaqpacha (upper world) for insight. The journey will be guided (initially) by voice to the hanaqpacha and will include a 32" Paiste gong. We will include the use of the Pachakuti Mesa, a shamnically empowered altar, and we’ll gain its assistance as a powerful container for our journey work. In addition, we will activate the mesa and perform limpias (or ritual cleansing acts) on one another. Ritual cleansings with the use of Peruvian Florida water, smoke & rattles assist us as we travel to the upper-world and request guidance from our high teachers. When: Sunday January 6th - 7:00-9:00 p.m.
Join us December 29th as we near a cycle of completion and close 2018. We will gather as community and let our imaginations flow; visioning and dreaming in the coming year. Initially we will begin by performing limpias on one another. (also known as ritual cleansing actions). By doing these simple rituals - using Peruvian Florida water, smoke & rattles/bells- we release heavy dense energies that can bog us down. With the aid of the limpias we may be free to move into the New Year feeling lighter and more spacious. We'll follow this ritual work - with a lovely vibrational gong journey - and ask our guides to join us and direct us with insight and tools needed for this powerful manifesting for the coming year. Finally to solidify our magical work - we'll play! Each participant will make a vision board/symbol to assist in the manifesting. This creativity is a ritual expression and physical object of the dreams and images that come to us when doing this work. We are letting the universe know how to assist us in our waking life, and help us brings those dreams into fruition. We'll have ribbon, magazines for collaging, glue guns, all kinds of fun stuff for creating your 2019 Dream-Vision. Saturday, December 29 - 1:00- 5:00 p.m. Please join us for a community celebration of the 2018 Winter Solstice. We gather as heart-felt people on this planet to honor our beloved earth and give our highest prayers of thanks & gratitude. Together we celebrate the longest night of the year, on the final full moon of 2018, and create a beautiful despacho,also known as a gratitude bundle. This ancient earth honoring ritual is a perfect way to offer our love to Spirit. People under 20 attend at no charge. No one turned away for lack of funds. Please keep the offerings small; paper (4”square max) 3D item(s). These gifts are “food” for the spirit realm. For example: feathers, crystals, grains, small art pieces, etc & will not be returned. Release 2018 fully and delve into 2019 anew!! This 50-minute session consists of sitting at a Pachakuti Mesa, a shamanically empowered altar derived from Peru and offers you a direct experience to go deeper within yourself with the assistance of the natural world. The Solstice Special includes a series of limpias - several simple processes that assist in removing heavy dense energy that may create imbalance and/or dis-harmony. In addition to the limpias, you will receive a hands on healing – infusing your spiritual, mental, emotional, physical & energy bodies with spiritual energy. Contact Jnana today for an appointment so you may step into the New Year bright and shiny. What better way to navigate holiday season and jump into a new year than to create a special stone that will remove dense, heavy energies? Daily we collect energy in our “poqpo”, our energy body, that can weigh us down. For this 2 hour gathering, we’ll do a few limpias, or clearings that will demonstrate how we may remove this energy and feel lighter. For a more potent limpia, you’ll be given a special stone that you’ll program as your extraction stone. This shamanically empowered item will be at your service to remove that gooey energy that keeps you from feeling light and clear. You may also use this stone with clients, friends, or family members. The extraction stone is a simple yet powerful process that reinforces that, yes, shamanism works!! Jnana Gowan, Sanctioned Teacher of the Pachakuti Mesa Tradition (PMT) and Pachakuti Mesa Tradition carrier, Ceremonialist, Transformational Worker will guide this evenings event. The journey itself will be guided (initially) by voice to the underworld and will include live drumming. Jnana's healing space is in Albany CA and she is available for private healing sessions and teachings on the PMT. Join us for this time of darkness as we near the Solstice. Let’s sew the seeds that will gestate and flourish in the coming year and use this sacred time to cultivate & fertilize new ideas & new ways of being. We will use a beautiful gong to travel to the upper world, also known as the Hanaq Pacha for insight and support. For this journey work, we intend to travel to the Hanaq Pacha to ask for guidance from our high teacher(s), to commune with the stars or be gifted a medicine teaching from the illuminated celestial beings. In addition to this support, we simultaneously benefit from the vibrational frequencies being offered. The evening will include the use of the Pachakuti Mesa as the container for the work, anchoring the journey in sacred space and safety. We will open the mesa and perform limpias (or ritual cleansing acts) on one another. By doing this ritual cleansing we travel as our truest selves, leaving behind hucha (dense, heavy energies), so the travels may be clean and clear. Per usual, Jnana will guide the journey, integrate healing ceremonial work and weave in sound healing instruments. Of course the awesome vibrational gong bath will assist all that join for deeper healing experience. Feeling despair, overwhelmed, off your center? This event provides a powerful prescription to keep yourself rooted and grounded. This is event is happening- take care of yourself with all the smoke---however, now, more than ever we MUST dig deep and do our work. Come together in a sacred circle with strong prayers of change, support and courage. These are wild and turbulent times, we are asked to sit up, be strong, assist others. These events are healing circles as well as shamanic journeying and are designed to help us stay steady. We are moving into the darkness of winter with a veil of smoke - join us to imbibe in the sustenance of this soul-work. Join us as we journey to the lower world (also known as the Ukhu Pacha) and dive into the interior realms, asking spirit for help. Journeying to the Ukhu Pacha offers the opportunity to integrate aspects of the self that have been fragmented, for whatever reason, and to welcome these fragments back. When experiencing this kind of process, the participant may experience a greater sense of wholeness. Now - more than ever - we need to come into wholeness so we may be strong for ourselves and community. The best way to be there for others is do your your healing, your own spiritual work. So come on. The evening includes Pachakuti Mesa as the container for the work. This mesa is a shamnically empowered altar - with a living lineage, deriving from Peru. This altar anchors the journey in sacred space and safety. We will open the mesa and perform limpias (or ritual cleansing acts) on one another. These ritual cleansings (with the use of Peruvian Florida water & rattles) ensure that we will travel to the underworld as our truest selves, leaving behind hucha (dense, heavy energies) so the travels may be clean and clear. To be in the creative is to be authentic. This workshop offers the opportunity to create a shamanically empowered feather wand in a ceremonial container. Our feathered friends have left behind their gifts for us to use - join us as we create a wand or fan for your spiritual practice or play. To hold a feather is to hold the wind. It is a special opportunity to connect with the winged ones that fly the realms above us. You may make a wand to assist you in clearing dense, heavy energy or you may want it to use it to connect with spirit in a deeper way. This crafting class we invite the spirit of the wind and those that fly through it. In addition we'll go a a shamanic journey - or a guided meditation & use the power of a crystal bowl to deepen our experience. This journey is to assist in the creation of the feather wand. If you know you want to attend this class- begin collecting your own feathers as part of your spiritual work (feathers supplied but you're invited to bring treasures from home to embellish your piece). This energetically charged item may be used for your spiritual practice - or serve as a meditation for the simple act of being in present time. The participant may choose to use this expression as a "give away" something made with love and intention, to be lovingly passed on to a friend. When: Sunday Oct 28, 2018 1:30-5:00 p.m.
RSVP- registration required - contact Jnana directly please. Materials supplied but a participants will be sent a materials list prior to class. September 22 is the Autumnal Equinox, the day and night are equal. With the powerful energies of the equinox, let's join together - the day before and prepare for the "balance point." At these special times of the equinox and solstice, cosmic portals are created where spiritual work may be magnified...By doing this work, the participant may experience a greater sense of wholeness. We have riden the wild waves of a summer full of eclipses!! It is time to stand on your surf board of life in equilibrium in deep gratitude. Shamanic work is a powerful prescription to keeping yourself rooted and grounded -it assists in allowing the wild to come through without taking over. Every month we meet to do this soul work - and this month you are invited to dive into the interior realms and ask spirit for help. You're encouraged to explore your inner world with the assistance of your animal ally. The summer of the "eclipse corridor" offered a good deal of chaos - by journeying to the Ukhu Pacha (or lower world) you are offered the opportunity to integrate any aspects of yourself that have been fragmented, recently or long ago, and to welcome these fragments back. The evening will include the use of the Pachakuti Mesa as the container for the work, anchoring the journey in sacred space and safety. We will open the mesa and perform limpias (or ritual cleansing acts) on one another. By doing this ritual cleansing (with the use of Peruvian Florida water, smoke & rattles) we will travel to the underworld as our truest selves, leaving behind hucha (dense, heavy energies) so the travels may be clean and clear. In addition to this - for tyou may ask for medicine gifts or be open to an initiation of some kind. Directing your animal ally is beneficial in this way – and we will discuss this more at the gathering. Jnana Gowan, Sanctioned Teacher of the Pachakuti Mesa Tradition and Pachakuti Mesa Tradition carrier, Ceremonialist, Transformational Worker will guide this evenings event. The journey itself will be guided (initially) by voice to the underworld and will include live drumming. Pop by for a (free) energy clearing and stay to make a "Magic Potion" (classes offered 1:00/3:00/5:00) I'm bringing a bit of the healing arts to the Art &Music Festival this year. Join us for the East Richmond Heights Community Art and Music Festival. This great event brings neighbors together in a spectacular setting, at the foot of the Gyuto Foundation Tibetan Monastary. Artists and musicians of the neighborhood sing, dance, play and showcase/contribute their talent in a street gathering that has everyone feeling blissful. This special was so well received - I am extending it. The July astologivcal forecast is a biggy, major masculine energy is lining up - as well as two eclipses ---- this is one way to stay steady in the wild winds! Join me at the Ukhu Pacha Healing & Inquiry Space for a Healing Session and Energy Infusion. The Solstice Special includes a series of limpias - several simple processes that assist in removing heavy dense energy that may create imbalance and/or dis-harmony. In addition to the limpias, you will receive a hands on healing – infusing your entire being with spiritual energy. Contact Jnana today for the extended July Special – so you may shine like the sun this summer!! With the combined guidance and assistance of Jnana Gowan & Madhu Anziani join us for an evening of deep exploration of personal & spiritual growth. This evening of magic will assist in releasing that which no longer serves; exploring other worldly realms and connecting more deeply to self and spirit allies. Using the powerful container of the Pachakuti Mesa, a shamanically empowered altar, we will practice the ritual art of limpias, energetic clearing/cleaning on one another in addition to the rich shamanic journeys. Madhu will guide us to the Ukhupacha - the lower realms via vocal looping & weave soundscape rhythms. He brings his deep insight of chanting & self reflection to the circle to augment the experience of each participant. Jnana will embellish the sound field with sacred instruments and lead the upper world journey with a 32" Paiste Gong. She will assist by offering a guided meditation to both worlds. The participant is invited to travel to both worlds: the ukhupacha; the inner realms & the place of the sub-conscious. A world where things are hidden within the shadow-self and may be brought to light and transformed. Then, to the upper world, the hanaqpacha; the superior realm. Here, one may meet ascended masters, high teachers and beneficent ancestral beings here to assist each person on their earthly path. To give space between these worlds, we will have a small break - enjoying a light snack and tea. Journey work has the potential to be extremely powerful and create change in one's life in a short period of time. The journey provides an expedited key to a gateway that has always existed. It is truly soul-nurturing work. We invite all levels of participants, those that are new to shamanism and those that have been on a medicine path for years. It is for everyone. - If you feel stuck, lost, isolated...join us to assist in a shift that may bring you back into wholeness. - - If you are a curious seeker, this might be just the prescription you are looking for. - If you want to be with folks that are on a quest for deeper connection to spirit, this is the place. When: Friday June 1, 2018, 6:00-10:00 p.m. PLEASE RSVP: We think this event is going to go to capacity - please reserve your spot!! Madhu Anziani is a vocalist whose sound has been described as “otherworldly, both a portal and a vessel for sound healing.” His vocal looping, weaving soundscapes and beatboxed rhythms with traditional Tibetan mantra and other sacred musical invocations, creates a deeply meditative soundscape. Madhu learned from the first-hand experience of being paralyzed as a quadriplegic, and used sound and energy healing to completely recover. He has studied Jazz and World Music and went on to be certified in Sound, Voice, and Music Healing at the California Institute for Integral Studies. He has studied very closely with Wisdom Healing Qi Gong Master Mingtong Gu and Peruvian Altomisayoq Don Oscar Miro-Quesada of the Pachakuti Mesa Tradition. Please join us for a community celebration of the 2017 Winter Solstice. We gather to celebrate the solstice through ceremony, dance, music, anointing, feasting and to create beautiful despachos to offer back to Spirit. We will honor our beloved earth and give our highest prayers of gratitude. Cost: Please donate $10 - $15 cover rental space, ayni for muscians & incidentals. Children attend at no charge. $20 max for families...no one turned away for lack of funds. The New Moon is a time of darkness. It is a time of the cultivation and fertilization of new ideas and news ways of being. This New Moon will coincide with a solar eclipse happening that same day...so we are bound to ride some wild cosmic waves. Join us as we use a beautiful 30" gong to travel to the upper world, also known as the Hanaq Pacha for insight and support at this very powerful time. In addition to this support, we simultaneously benefit from the vibrational frequencies being offered. Consisting of five weekend intensives, this is an apprenticeship into a living lineage of Peruvian Shamanism. Part I is open to all those wishing to deepen their connection to Spirit and the animate universe, no prior experience is necessary. Parts II-V, build upon the teachings and initiations received in the prior weekends, which are prerequisite. These apprenticeships consist of five weekend intensive gatherings involving hands-on practice and initiation. This series is called The Pachakuti Mesa Tradition: Cross-Cultural Shamanic Arts for Personal and Planetary Renewal. The PMT is a profound yet practical, user friendly, living shamanic tradition dedicated to both personal and planetary healing. As both teachers facilitate this apprenticeship, one's own innate healing and spiritual potential is awakened. The apprenticeship revolves around the creation of your mesa. This is a shamanically empowered altar, unique to you, yet following the traditional, ancient Andean template. The mesa provides a living, vibrational technology of the sacred from which you may draw upon and apply a a vast array of shamanic healing modalities and capacities that have come down to you from over at least three millennia. Judy Hoagland: A senior teacher of the PMT, sanctioned and personally trained by Don Oscar Miro-Quesada, will co-teach this series. She lives in Santa Rosa where she teaches classes in shamanism and incorporates the PMT, reiki, bioenergentics, hypnotherapy and intuitive guidance into her private healing practice. 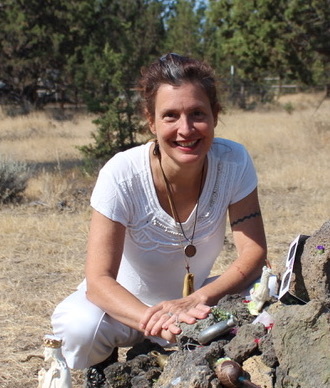 Jnana Gowan: As the director of the Ukhu Pacha Healing and Inquiry Space in Albany, California, Janna has a private practice and leads transformational programs which combine her depth of knowledge of yoga, ritual, ceremony and healing. A PMT mesa carrier since 2008 and a teacher since 2000, she's completed the 5-Part Series (twice). She has gleaned deep tachings from her apprenticeship-work with author and healer, Mateo Magee. Join us on Saturday, November 4th for a time of ritual and ceremony. We will make individual cleansing waters, designed and created by you. With the use of your intuition, a pendulum and the power of vibration (a 34" gong), you will create your own special potion. You may use this potion on yourself or on others to remove dense, heavy energies known as hucha. You may also choose to use your specialized water infusion to connect more deeply to the plants that have chosen you, or simply enjoy the aromas of your own personal floral essence water. Charged by the light of the full moon on the night before our gathering, these dreamy waters will be infused with floral essences/essential oils - creating what is needed for YOU. In addition, for our special workshop, we will will recruit the assistance of a shamanically empowered altar, known as a Pachakuti Mesa. This altar is originated by Don Oscar Miro-Quesada, a healer from Peru. The mesa hold the forces of nature and all the elements of our Earth and works with the spirit realm. PLEASE NOTE: PRE-REGISTRATION & PAYMENT IS REQUIRED. RSVP Deadline: Thursday, November 2, 2017 by 7:00 p.m. When: Saturday, November 4, 2017, 1:00 - 4:00 p.m.